This deep fried Oreos recipe results in warm, chocolaty, oozy packages of goodness just like you get at the Texas State Fair and they are much easier than you think! The batter gets crispy, the chocolate cookie gets soft, and the creamy filling oozes out in every bite. 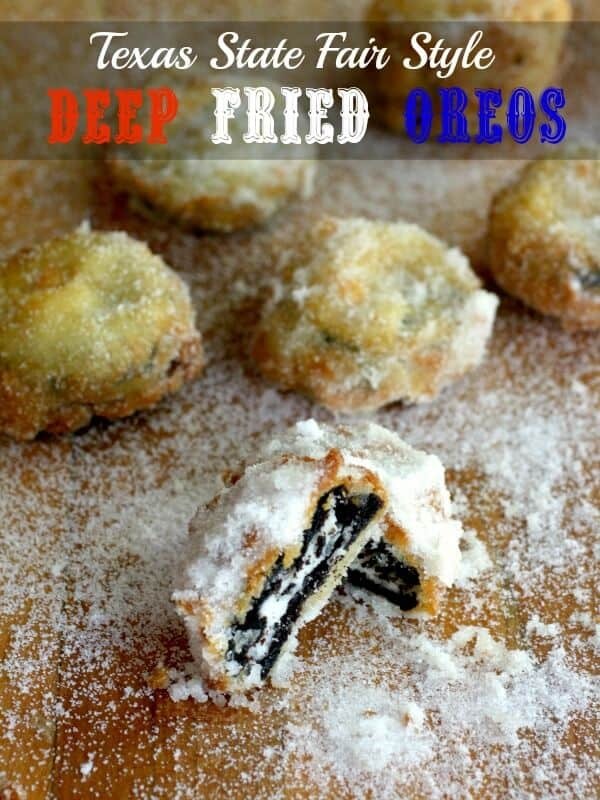 Knowing how to make deep fried Oreos means you can indulge in that great fair food anytime you want! Deep fried Oreos are one of those Texas State Fair foods that you can make at home if you start craving before the fair is even on the horizon. Just about now, the first of summer, I start thinking about the food at the fair in September. Sometimes I think about it way too much. I made them as part of an assignment for a magazine client in an article on State Fair food and I thought I’d add the recipe here in case you were interested. When I asked on Facebook some of you were like, “YES!” and others were like, “ICK” so if you were in the “ICK” group you can move along to something you like better… like… my version of Berger Cookies. These are not in any way, shape, or form anything that could be called healthy. They are grease and sugar held together with cholesterol and calories. Eaten every day they are going to cause a problem but on an occasional basis they’re fine. We had a fry day here this past weekend. I knew I had to do the frying for this article so my daughter and son-in-law and the grandkids came over to help us pig out on State Fair food. 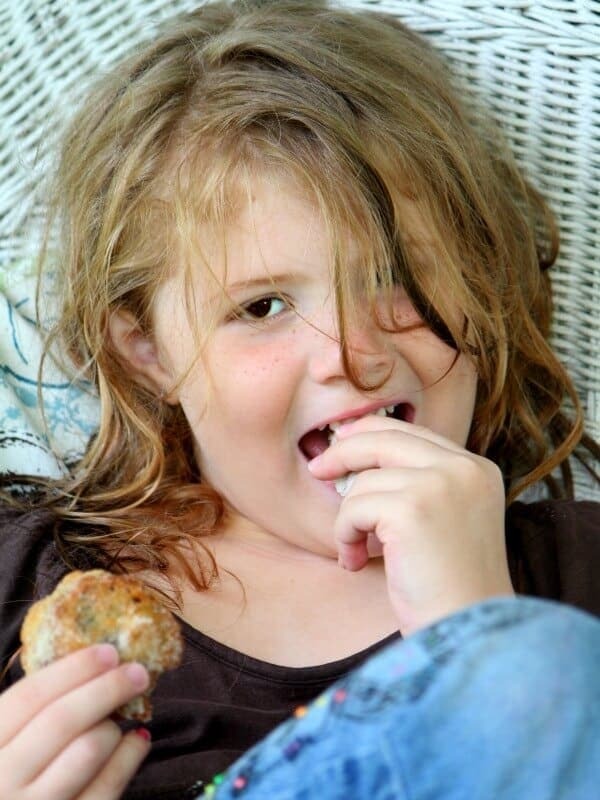 Everyone was suspicious of the Oreos at first but once they ate one they were hooked. It’s one of those things you have to eat just as they come out of the fryer, though. You can’t save them for later. I’ll be honest. I go to the state fair for the food and the beer/wine tasting. I want to try everything, even if it does sound weird. I keep thinking I want to have a State Fair themed party one of these days, with potato sack races and lemonade and lots of fried food. It seems like it would be a lot of fun to plan as well as to attend. This fried Oreos recipe could not be easier, y’all… but here are a few tips to ensure your complete success! I use peanut oil because it fries cleaner than most other oils and makes things light and crispy. If you have peanut allergies to deal with then any light vegetable oil is fine. Be sure to clean your fryer and replace the oil often. Rancid oil will make your fried foods taste gross. Try all of the Oreo variations to see which are your favorite. I’m a classic gal, myself. Use powdered sugar instead of sugar crystals to dust them after they’re fried if you like. Keep small kids and pets out of the kitchen while you are frying – the hot oil can really injure you, your kiddo, or your pet if you stumble over someone in a crowded space. 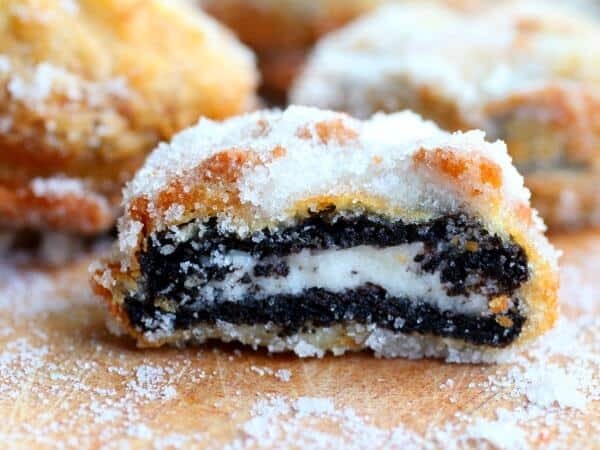 Beware… knowing how to make deep fried Oreos means that you’ll be harassed constantly by family and friends to serve them at every movie night and pool party! If you are going to make these I’d suggest making them in small batches unless you are entertaining and you have a ton of people. It’s a fun recipe but the cookies are rich and you really can’t eat all that many. You can also make a great, no bake chocolate crumb crust with them! Deep fried oreos just like you get at the state fair - hot, gooey, chocolatey goodness in one bite. Preheat the oil in the fryer to 375F. Mix the egg, milk, butter, vanilla, and pancake mix until smooth. Dip a cookie in the batter, covering it completely. Carefully slip it into the preheated oil. Roll in sugar, Confectioner's sugar, or sugar and cinnamon. My son and I LOVE fried oreos. I can’t wait for him to get out of school so we can make some. I really love the birthday cake Oreos fried almost better than regular double stuff. Try them all and suffer with a sugar coma! Oh, that does sound good. YUM! I usually try to eat healthy but make a few exceptions here and there. This might have to be one of them. My goodness, you have some pretty amazing treats and these deep fried Oreos take the cake! Seriously insane how GOOD these look, yum!! I can’t believe how delicious these look! YUM! These are always one of my favorite things at the Texas state fair!! SOO GOOD. Would love it if you would come share at my link party! Never in my life have I ever had something like this – OH MAN that looks so friggin’ amazing! I’ve never seen a recipe for these before, this is awesome! And yes, I’ve tried them at the Texas State Fair! Along with the deep-fried s’mores, deep-fried beer, and a coconut cream pie milkshake. I grew up going to the Fair every year as a kid, but since I moved away from Texas I hadn’t been in YEARS, but a couple years ago I was able to go back and take my non-Texan husband. Seeing it through his eyes was priceless! Haha! 🙂 Now you can make them. I’m glad you got a chance to bring your husband – hopefully it’s something you can do again. Oh my! I agree with the other comment, these must be so rich but would be a very fun dessert for a special occasion!! They are! Thanks for dropping by.